Posted May 25, 2018 by Sardis Pastor Pastoral. How’s your credit? What’s your credit score? I had these questions asked of me recently when I purchased a new to me vehicle. I had no idea, but I found out both my wife and I had a better credit score than 95% of folks. But it got me thinking about debts and who we owe for what. And the gut wrenching, character revealing question, do you pay your Debts? The apostle Paul hits on this topic in Romans and proclaims we are all debtors. But the revealing issue is not that we owe, but who we owe a debt to – not to the Flesh! We owe nothing to ourselves, our bodies, our physical wants and desires, which gratify the flesh. We owe no debt to the flesh, such that we should live according to the flesh, and be driven by the flesh and its desires. Rather it’s the Spirit to which we are indebted, to which we owe our lives and our living, and the energy and days of our lives. As Christians, we all should be ones who pay our debts, especially our debt of gratitude to God. But Paul reveals the frightening truth about life and whom we choose to live it for in verse 13. “For if you live according to the flesh, you will die.” Well, yes, everybody dies you might think. But the death of which Paul speaks is an eternal death, where the grave is victorious and the sting of death is eternally painful. If we give our lives to living for the flesh, living selfishly, self-centered and me-only focused, in the end we fail to repay our debt to God. We fail to repay our debt to Christ for the grace we have been shown, to the Spirit for its indwelling presence, and in the end we tragically lose everything. No, Paul exclaims it’s the Spirit to which we are debtors, for its indwelling, for its presence and power in our lives, and for the pardon and grace we have received. 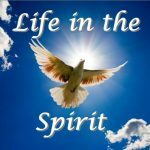 And heavenly truth is revealed to us – “but if by the Spirit you put to death the deeds of the body, you will live.” If by the Spirit, we live our lives leaning on the Spirit, with its guidance, strength, and power, we can crucify and put to death the desires and deeds of the flesh which do not please God. We acknowledge our indebtedness by submitting the living of our lives to the Spirit thereby pleasing God. In doing so, though it seems contrary, we truly live and experience life in abundance with peace and joy. But there is more, there is a greater truth at play here, we become more than merely ones who pay our debts. We become more than just ones who have a good credit score and reputation. Paul saves the best for last and slams the gavel down and shouts, as if to say, don’t you understand – “For all who are led by the Spirit of God are children of God.” We move from debtor to family member. Through the Spirit we are reborn and are adopted into the family and become children of God. We become joint heirs to the kingdom and just how awesome is that? So my dearest brothers and sisters, quit living for and serving the flesh – that brings only death. Choose instead to live in and by the Spirit. Life, joyously abundant life, and an awesome family awaits you!